The Rockefeller Center is a place in New York City, built by and named for John D. Rockefeller and his family. Luigi visited it during the events of Mario is Missing!, after Koopa Troopas invaded the city and stole artifacts from its landmarks. 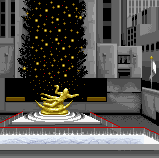 From the Rockefeller Center, they took the golden Statue of Prometheus, and Luigi had to find and return it to the Center, for which he was rewarded 1,700 dollars. Radio City Music Hall was made world-famous by the dance troupe, The Rockettes. The all-female group was started in Missouri in 1925. They took their name from The Roxy theater, the original New York City home. The Rockettes have performed their high kicks in Radio City since its opening day in 1932. The Music Hall was built to be the largest and showiest theater in the world, despite the Depression which was then at its worst. The theater is a famous Art Deco landmark. Nintendo New York is located at Rockefeller Center. This page was last edited on March 29, 2018, at 18:08.